High quality slush machine stand, fully branded for maximum impact. With lockable storage, waste bin and options including cup holders optional rear panel branding and trolley wheels. LEAD TIME - 10 WORKING DAYS. 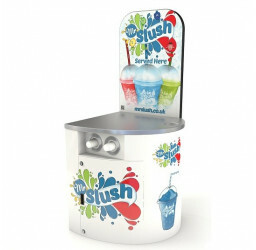 Premium heavy duty slush machine counter display stands which can be fully or partially branded with our Mr Slush. High impact, maximise your slushie sales. Or rent this serving station for £99 + VAT per month. Our Mr Slush branding is included at no extra charge on the understanding that only Mr Slush will be served. Retailers who change brands will be required to return our branding.